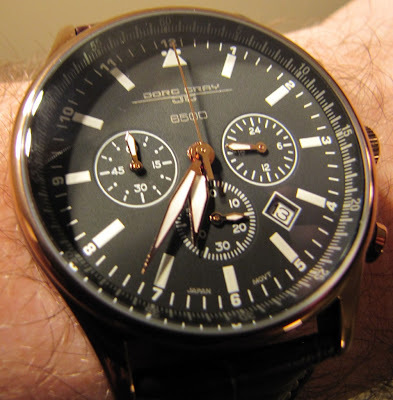 I just spotted this one on The Wrist Watch Review. Click through for the full review. This is a bronze version of President Barack Obama's Jorg-Gray. I have the original which I love but the glass is getting a tiny bit cloudy underneath. I plan to replace it with sapphire crystal one day. I do like this bronze look. It's a bit steampunk in style actually. Check out the Jorg Gray label below for a few more posts and designs and of course, one of the best places to go window shopping is on eBay. If you have an RSS reader, click on the RSS link below to have them come to you.